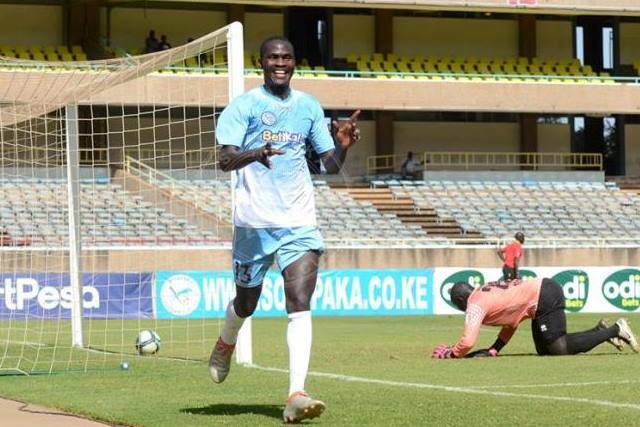 Umaru Kasumba struck a brace as Sofapaka beat league leaders Mathare United 4-1 on Tuesday evening to move to within two points of the Slum Boys. Elli Asieche and Titus Achesa grabbed one each with former Sofapaka man kevin Kimani scoring the consolation for Mathare. The victory took Sofapaka to third in the standings with 23 points, two behind joint leaders Mathare United and Bandari. Sofapaka, on a run of four wins in five matches started the match strong and with just two minutes on the clock, the deadlock was broken. Citing keeper Allan Owiny yards off his line, Asieche took his luck striking a shot from distance which dipped under the keeper’s arms. It was a confidence boosting goal that the team needed to get their feet firmly into the game. Brian Magonya should have doubled the tally in the 12th minute when he exchanged passes with Cornelius Juma to break into the box, but his eventual shot was a straight aim at Owiny. Mathare’s first chance came in the 19th minute off a freekick from a good scoring range, but Kimani’s curling effort was well gathered by the impressive Justin Ndikumana. On the half hour mark, Sofapaka made it 2-0 in emphatic fashion. John Avire stole the ball off Roy Okal before the midfielder brought him down. Achesa stood behind the freekick and took a decent curling effort that sailed into the top right, aided by a slight deflection on the wall for his first Sofapaka goal. AT this point, it was Sofapaka all the way. Kasumba was in a decent position three minutes later when he swung a first time shot from the edge of the box, but it flew straight to Owiny. On the other end, Mathare had a chance when a clearance from Mousa Omar landed kindly to Ahmed Ahmad, but the striker’s shot was wide. Three minutes to the break, the game sailed to comfortable distance as Kasumba added the third. John Avire’s ferocious freekick was spilled by the keeper and Kasumba was quickest to react smashing the ball home. Sofapaka was forced into an early sub when Asieche had to come off after a clash of heads celebrating Kasumba’s goal and was replaced by Kitawi. In the second half, Mathare came back stronger and pushed Sofapaka to defend deep. Five minutes after the restart, Ndikumana was forced into a good save at his near post to deny Kevin Kimani who had been teed up by James Situma. Kitawi had a great chance after 57 minutes when Avire picked him out with a good cross off the right, but he took way too many touches allowing the keeper to collect. On the other end, Mathare had another chance off a setpiece, but Ndikumana was well placed again to collect. But, the hosts pulled one back after 72 minutes when Kimani stabbed hom from the right, beating Ndikumana at his near post. Mathare pushed to try and cover the two goal deficit. While they pushed, Sofapaka should have taken the game to bed in the 80th minute when Magonya sliced the defense with a brilliant through pass to Avire, but the striker’s effort was wide. Kitawi had another chance minutes later when he thrust forward from midfield, but he chose to pass instead of taking a stab at goal from a good scoring range. But Kasumba put the game’s tension to rest in added time. Soter Kayumba took a freekick quick dipping it behind the defense and Kasumba did the rest, striking a thunderous effort past the keeper, the ball hitting the underside of the bar before crossing the line.